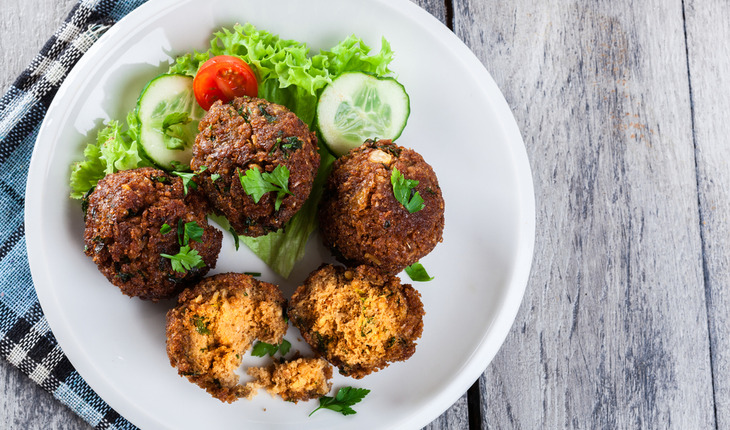 Want a delicious + easy vegan falafel recipe, using ingredients you likely have in your pantry? Look no further! With no egg or bread crumbs, this vegan recipe rules! And yes – you can use canned garbanzo bean, but the taste is extra special with dried chick peas, and not much more work. Serve with tzatziki, lettuce, tomato, and cucumber. Rinse the chickpeas under cold water and discard any bad ones. Place in a large pot, and cover with water. Let soak 24 hours, then rinse again. Place the chickpeas, onion, and potato into a food processor. Cover and process until finely chopped. Leave about 1 cup of the chickpea mixture in the food processor bowl, and pour the rest into a mixing bowl. Add the garlic, cilantro, coriander, cumin, salt, pepper, and cayenne pepper to the chickpea mixture in the food processor bowl; process on low to blend thoroughly. Return the reserved chick peas mixture to the food processor bowl, and add the lemon juice, olive oil, and flour; process on low until the mixture becomes a coarse meal. Cover and refrigerate 2 hours. Stir the baking soda into the chickpeas mixture until evenly blended. Using damp hands, form the mixture into 1½ inch diameter balls. Pour the your choice of cooking oil into a wok 1 to 2 inches deep, and heat over medium-high heat. Cook the falafel balls, turning so all sides are evenly browned, about 5 minutes. Remove falafel from oil, and drain on paper towels. Repeat to cook remaining falafel balls. If you don't have time to soak the dry chick peas, just substitute three 15 oz. cans of chick peas + start with Step 2.